Kerala Hotel, right next to INA metro station is a great spot for non-vegetarian, spicy food filled with flavours from the South. There isn’t much seating to speak of. I generally get dinner packed from here on my way back home. Since it’s right next to a metro station, I don’t even need to go out of my way. Chicken Biryani and Prawn Roast. 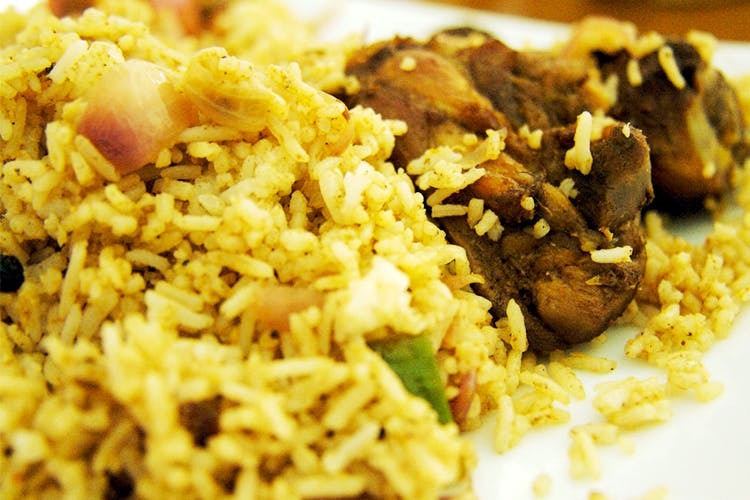 The Chicken Biryani is not your typical biryani. It has achaar which gives it a very different tangy taste and the chicken chunks seem to be pre-fried. The Prawn Roast is absolutely delicious but if you can’t handle spice, don’t order it. It’s packed to the brim with chillies. Kerala Hotel is the perfect pit stop while you’re commuting home for a packed meal at incredibly reasonable prices.